« What Does “Fantasy” Evoke for You? Tah-dah! (Trumpet Flourish). Today Alan and I are happy to announce the 150th entry to the Sir Julius Vogel Award nominated Thursday Tangents. In hono[u]r of this occasion, we’re hoping you can solve a mystery for us. ALAN: Everyone calls the facility a tip, but I think the city councils must have objected to the colloquialism because all the road signs pointing to the tip say “Landfill.” And once upon a time, that’s exactly what they were: just a great big hole you threw stuff into. Eventually, it filled up and got smoothed over and the landfill closed and re-opened somewhere else. But these days the tips are much more sophisticated operations than once they were, and now there is a genuine attempt to separate out the various items and reclaim or recycle whatever can be reclaimed and recycled. I find that very laudable. JANE: I agree. One of the first Wednesday Wanderings I wrote was about a trip we took to the dump with a friend and my reaction to finding that it was now possible to drop electronics, for example, off where they would be recycled. This was in late January of 2010. I haven’t been back since, so I don’t know how the process changed. However, as in your part of the world, the name has been changed to reflect a new mission. ALAN: Ah, pomposity. Don’t you love it? JANE: Anyhow, I went over to the “Landfills” entry and discovered that we have four places to dump or tip garbage or trash. Three are now termed Residential Convenience Centers but one persists in being a landfill, making me think it must be inconvenient. I was a little surprised that you mentioned various things – jigsaw puzzles come to mind – that you tipped into the tip that seemed as if they might have some use left in them. If it were me, I would have taken those to a thrift shop. Do you have anything like that there? ALAN: Yes indeed. Two large charities run them, the Salvation Army (“the Sallies”) and the Society of St. Vincent de Paul (“Vinnies”). The outlets that you call thrift shops we’d call op-shops. I assume that’s short for opportunity shops on the grounds that the bargains they contain represent a great opportunity! A friend of mine who loves clothes has a lot of stunning outfits that she’s rescued from op-shops. JANE: I love the term op-shops! It sounds like a place where spies would shop. Q would have a room in the back where scratched and dented espionage tools could be bought for a bargain. Acid pens that fire jam or smoke tablets that transform your car’s exhaust into a bright pink cloud. ALAN: Shades of Dashiell Hammett’s Continental Op – maybe that’s how he outfitted himself. Or maybe we’ve both got far too vivid imaginations! JANE: Too vivid? Us? Never! We have a much wider variety of thrift stores here. The name “Goodwill” is practically synonymous with “thrift shop,” but other charities operate them as well. It’s quite possible to recycle gently used items this way and hope you’re helping some organization raise money. I was curious. How is your recycling collected? You mentioned a while back that containers are supposed to be rinsed out. That’s true here, too. However, do you sort items or do they go into one big bin? ALAN: The cardboard, paper, tins and plastic all jumble together in a big bin with a yellow lid (the council seems to be inordinately fond of yellow). The glass has a separate bin all to itself which is, unfortunately, turquoise. Each bin is collected on alternate weekly cycles. When it’s the turn of the glass, a massive truck rumbles slowly up the street hotly pursued by very athletic men who pick up the bin and throw the glass into the truck, generating very satisfying crashing, smashing noises. When it’s the turn of the other stuff, a different truck with a mechanical arm picks up the bin and empties the contents into itself quite quietly. I have no idea how they separate the elements out at the other end, but they must have some sort of system. There’s a threatening label attached to the bin which lists things that are allowed in the bin and things that are not. Dire penalties await those who disobey the instructions. JANE: Interesting. Our system is similar in that cardboard, paper, cans, and plastic are all put into one large, bright blue bin. I’ve also wondered how – or, sadly, even if – these items ever get sorted and used or if we’re just going through the motions. Glass is not collected at all. I heard this is because a sanitation worker (formerly known as “garbage man” or “trash man”) was cut very badly on glass. Glass can be dropped off at various places, which is a good thing, because glass is one item that recycles very well. A friend of mine briefly worked for a company that took used glass and transformed it via heat into a perlite-like substance that had various uses, including (if I recall correctly) being used in potting soil in place of peat. ALAN: “Sanitation Worker”? Don’t you mean “Environmental Reclamation Technician”? Or possibly “Specialist Disposal Engineer”? JANE: I like that! Almost Orwellian… But, go on. ALAN: Here, the rule is that broken glass won’t be collected. We are supposed to wrap that carefully and dispose of it with the normal stuff that goes in the yellow council rubbish bag. The truck that they throw the recyclable glass into is covered over so that there is no possibility of “splash-back” causing injuries when the glass is collected and tossed in. They are really as safety conscious as they can be. JANE: Many years ago, when I still lived in Lynchburg, Virginia, the city had a voluntary recycling program that worked very well. Neatly labeled dumpsters were placed in the parking lots of various grocery stores. It only took a moment to go by and pop recyclable items into the appropriate place. Then the city collected the already sorted items and distributed them to businesses that would turn them into something useful. As I said before, I do wonder if somewhere there are conveyer belts where someone sits sorting all the things we dump into our recycling bin. If not, it’s just a scam. ALAN: I wonder if one of our readers knows where we could find the answer. This entry was posted on April 10, 2014 at 1:00 am and is filed under Thursday Tangents. You can follow any responses to this entry through the RSS 2.0 feed. You can leave a response, or trackback from your own site. Heh. Years ago, my mother had a cat named MRF, for Materials Recycling Facility. That’s where she found the cat, and that’s what it was. They do indeed have a facility where people (in that case, mostly Mexican and central American immigrants) sorted the recycling that came down the conveyor belt into bins. They use magnets in part of it to pull out the iron, and so on. That cat liked Mexican food (especially tortillas and cantaloupe) her entire life. She also loved playing with plastic, but had to be taught what grass was. Early environments are important to cats it seems. The basic reason they do this is because people were too careless with the multiple recycling bins that separate out paper, glass, and plastic, and they had to sort it anyway. To this day, one of my mom’s neighbors simply dumps her trash indiscriminately in every bin, just as she has for decades. As for what happens to recyclables afterwards…it depends on international markets in recyclables, which are quite volatile. A lot of recycling goes overseas, particularly to China, but also to Africa, where it gets (re)used. Low quality recyclables (and here I’m thinking mixed paper) tend to get landfilled if the price for them gets to be less than the transportation costs, which it often does. One reason we don’t often see those recycling drives any more is that the scouts bringing in bales of paper would overwhelm local recycling capacity, and if there wasn’t a market for the stuff they’d brought in, it all had to be landfilled, which cost the municipality in tipping fees. Should I point out that the rags that go to Salvi or to Goodwill can end up in Africa too, where our ultra-cheap secondhand clothes have driven many of their indigenous clothesmakers out of production? Or is that too depressing? We’re actually a lot worse at recycling some things than we used to be. For instance, decades ago, people brought bottles back to the grocery store, because they would be washed and reused. There were only a few standard bottle sizes, and it was a simple matter to send the bottle back to the manufacturer, who would take off the label, clean it thoroughly, and resell it to the product manufacturer to refill. That’s a good recycling system. Nowadays, bottle shape and color is supposed to be part of the product’s brand, so there’s no uniformity at all. Glass gets sorted into approximate colors, broken up, and reused if possible. Heavily colored glass is difficult to reuse, for obvious reasons (what’s the color and quality of a mixed batch of broken glass? ), so it gets put into concrete or products like those funky new countertops or flame features. Still, this wastes a lot of energy, because the bottles have to be cleaned, broken, melted, and reformed into a new product, and as color gets added, the ability to reuse them as anything other than building material goes away. Cleaning and refilling a bottle is much more efficient, but we’ll have to wait a few more decades for that to come back into style. Don’t think this is still true but, at one time in one place in Virginia, if someone tossed in a piece of tin with plastic or glass with paper, they discarded the whole load from that particular bin. I think they do the sort of sorting you cited by now. In doing some research, I just came across one use for recycled glass. Apparently, it’s used to make marbles because it’s harder than “first run” glass. There’s also a factory here in Albuquerque that makes a sort of fake pearlite out of recycled glass. It’s used for lots of things, including an additive in potting soils. They ship a lot of it to the Dutch, weirdly enough. But you’re absolutely right that this is not energy efficient. A while back “Re-use” was being promoted along with “Recycle.” Perhaps we need to take a look at that approach again. Thanks for reminding me! I’ve collected a bunch of those marbles over the years. They tend to give them out at recycling fairs, on Earth Day, and the like. As for fake perlite, natural perlite is made by heating hydrated obsidian, and obsidian is just volcanic glass. It gets used in a lot because it’s so light, which is especially handy in container gardens well off the ground. Natural soil is pretty heavy, after all. As for Reduce, Reuse, Recycle, that’s still around, and it’s properly a descending order of priorities: produce less trash, reuse at least some of the trash you produce, and recycle as much of the rest of possible. As for the marbles… Commercial marbles, too, not just collectibles. ouch! i assumed that would stay neatly wrapped in the box. sorry! The real advantage to sorting isn’t the revenue, it’s the savings. Running a landfill is expensive, and building new ones is getting to be impossible near most major metropolitan centers. 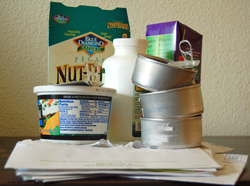 Recycling works by keeping stuff out of the landfills. If they bring in some cash too, even better. Definitely – in fact that’s what’s pushed TO into being so aggressive about it. That and having had to shut down all its incinerators a few decades ago. Of course, the typical Canadian combination of attitudes that leaves us either not doing at all or overdoing means that the sorting and composting facilities are overwhelmed on a regular basis – so a lot of it ends up in the dump anyway.